When it comes to Montana, the state inspires thoughts of the big open sky that seems to never end and some of the best state and national parks in the country. With breathtaking and all-consuming wilderness, the Big Sky State is abundant in outdoor recreation. Montana is a wild country and those who choose to go try and see some of the secrets of the secrets that it holds will not want for choice when it comes to places to camp. With a wide range of developed campgrounds within the state, visitors are sure to find one that suits their needs and is close to the natural sights that they want to see. Glacier Campground is the closet campground to West Glacier, otherwise known as the western entrance to Glacier National Park. The campground has all the modern amenities including a lovely little restaurant called Cajun Mary's Cafe, but it is nestled within the Flathead National Forest. With tall timber and underbrush everywhere, this campground may be developed, but it feels like an old-fashioned campground with seclusion and privacy. For those that have headed to Glacier National Park for white water rafting or other water activities, they will not be disappointed. The campground is located next to numerous rivers, lakes and streams as well as Flathead Lake. While there is some great hiking in Glacier National Park, there is an alternative option to see the park within walking distance of Glacier Campground. Glacier Heli-Tours takes visitors up in their helicopters and around the park for an aerial view. There is also an option to take horse riding tours nearby the campground from local outfitters. So between the beautiful campsites and all the activities surrounding the campground, Glacier Campground is one of the best in Montana. Bear Canyon Campground is primarily an RV park, but with 30 tent sites, there is plenty of good old-fashioned camping for everyone. However, what makes this campground so special is the view. The campground is situated on the hillside overlooking the valley below, but hosts more spectacular views of the mountains in the distance and the fantastic sunsets over them. Bear Canyon has all the perks of an RV spark with laundry, a general store, clean bathrooms and an outdoor pool, but with all the views that one would expect from a tradition campground. 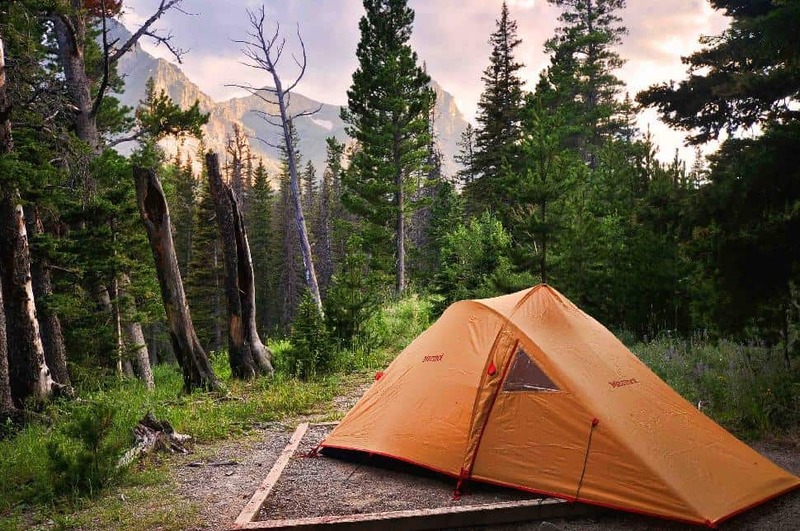 It is an excellent stay for those that want to explore Bozeman, but it also situated near Yellowstone National Park near the Wyoming border so that campers can fulfill all their hiking and wilderness needs. There are also the massive collection of mountains outside of Bozeman which the campground overlooks that are ripe for exploration. With some peaks rising over 12,000 feet, it is an adventure waiting to happen. Located on the Hell Creek Arm of Fort Peck Lake, the campground within Hell Creek State Park is not only great accommodations for the park's hiking and water sports but also serves as perfect for fishermen that are visiting for the world class walleye fishing. There is a boat launch nearby the campground, so more than a few visitors on fishing trips often choose to use the campground for overnight visits. Since so many visitors stay to fish the lake, the campground even has a fish cleaning station open during some months of the year. Hell Creek State Park stretches along the water, so there are not many opportunities for hiking, but for those that want to boat, fish or explore the water, there is no better place to be in Montana to roll out your air mattress. Grand View Campground is nestled on the outskirts of a little town called Hardin that is the modern day setting of the Little Bighorn Battlefield, or better known as the setting of Custer's Last Stand. Every year visitors who come to tour the battlefield come to Hardin and stay at the campground. The campground is also popular lodging for those that come to fish the Big Horn River as well as those that come to play golf at the Fort Custer Golf Course, which is often referred to as the best course in the state. The Grand View Campground serves as sort of a home base for those that want to come out and boat, water ski and jet the Bighorn Lake. However, one of the more exciting attractions near the campground is the Crow Reservation. A visit to the reservation is a fantastic way to experience the culture and tradition of the Apsaalooke, or "Children of the Large-Beaked Bird". While Grand View sits near Hardin, it is far enough outside of town to avoid most of the city noise. However, because it is so close to civilization, campers are afforded some excellent amenities and are close to any convenience they could possibly need. Nestled in the West Fork Valley of the Bitterroot Mountains is the beautiful Painted Rocks State Park. The area gets its name from the colorful green, yellow and orange lichens that cover the rock walls and cliffs giving the rocks a painted appearance. Within the park near the Painted Rocks Lake is the campground for the area. This smaller campground is located in a scenic western pine forest that provides seclusion to the sites. Visitors can boat, swim or fish around the lake but many choose to hike the land. Around the park, hikers can spot abundant wildlife within the park including elk, black bear, moose and bighorn mountain sheep. The area is also a great bird watching spot for osprey, spotted sand piper, kill-deer and the occasional great blue heron. Hikers can explore the area where Lewis and Clark passed through in 1805 and what was once a prosperous trade route for the fur trade. The campground is a wonderful home base to experience this fine slice of Montana wilderness.